* If you are being automatically redirected to this page, you must scroll to the bottom and accept the rules prior to being allowed to place your first bid. By placing a bid in this sale, you acknowledge and agree that you are bound by these Auction Procedures and Conditions of Sale. This auction is presented by Grey Flannel Auctions, Inc. ("GFA"). The auction is conducted under these Terms and Conditions of Auction and applicable state and local law. Any person participating in or who registers for the auction (hereinafter "Bidder") agrees to be bound by and accepts these Terms and Conditions of Auction. GFA is the final arbiter of these Terms and Conditions to the extent permitted by law. Items are sold to the highest bidder in an "AS IS" condition. Bidding is scheduled to begin immediately via the internet and telephone with the auction culminating on Wednesday, December 19, 2018. Please see Submitting Bids, 9:00 p.m. MST (11:00 p.m. EST) rule. A BID PLACED IN THIS AUCTION WILL BE CONSTRUED BY GREY FLANNEL AUCTIONS TO BE AN AGREEMENT BY THE BIDDER TO ACCEPT ALL CONDITIONS AND TERMS SET FORTH IN THE BIDDER INSTRUCTIONS. In order to bid in this auction, you will need to have a bidder I.D. You may obtain a bidder I.D. by calling (631) 288-7800 ext. 223 during our regular business hours and registering. You will be asked to give two hobby references at the time of your registration. If you cannot supply these references, Grey Flannel Auctions may ask you questions regarding your credit. You will need to register only once, and this will give you a permanent bidder I.D. for Grey Flannel Auctions. Please call to register before 4:00 p.m. MST Tuesday, December 18. After this time, we will register no more bidders without exception. Placing a bid constitutes acceptance of Grey Flannel Auctions’ rules and Grey Flannel Auctions has the final say in interpreting all rules. Bidding begins immediately by phone and online. Online bids will be accepted at www.GreyFlannelAuctions.com (the "Site") for this auction. Please check the GFA web site for instructions. E-mail and fax bids are prohibited. No lot will be closed until the entire auction is over. No exception to this rule will be permitted. The auction will close for initial bidders at 9:00 p.m. MST (11:00 p.m. EST) on Wednesday, December 19 ("initial bidding"). Failing to bid on an open lot prior to the close of initial bidding forfeits Bidder's eligibility to bid on said open lot after the close of initial bidding. Bidder may bid on any unopened lot after the close of initial bidding. Where Bidder is the sole bidder on a lot at the close of initial bidding, Bidder will be declared the winning bidder. GFA reserves the right to extend this rule for any reason. For ongoing lots after the close of initial bidding, the 10-minute rule will be applied. The 10-minute rule means the auction will not end until there are no bids for the entire auction for a period of 10 minutes. The entire auction will close simultaneously, not one lot at a time. Ten percent (10%) minimum increase, in whole dollar amounts. There will be no exceptions. Please see “Up To Bids”. All winning bids will have a 20% buyer’s premium added to the final hammer price. All bidders must pay buyer’s premiums; no exceptions. Each lot within the auction has a minimum bid, opening bid and/or reserve designated in both the catalog as well as in the online listing which need to be met for an item to sell. A small sampling of lots may have a confidential reserve. The reserve is the confidential minimum price that a consignor will accept before their material sells, this means that a bid of equal or greater than the reserve must be placed for the bid to be successful. GFA may bid on behalf of the consignor and may secure increments up to the amount of the reserve, by placing successive bids if necessary. In limited instances where Grey Flannel has a financial interest in a lot beyond our commission we may place a bid to protect the investment. Reserves when in place will be predetermined and set within the auction prior to the end of the sale. These lots will be designated by "Opening Bid". GFA reserves the right to bid on any lot which it feels is below market and a sound financial investment. All items in the auction (unless an item is withdrawn) without a reserve they will be sold to the highest bidder at or above the minimum bid. All State of New York and Arizona residents must pay sales tax. Since each county is different, the appropriate tax will be included in your final invoice. New York and Arizona dealers: if you have a resale number, please make sure that we have it on file or you will be charged sales tax. An “up to” or “max” bid is simply the highest dollar amount that you would empower Grey Flannel Auctions to bid on your behalf for a particular lot. Grey Flannel Auctions strongly encourages you as the bidder to place up to bids. This is the easiest and most efficient way to ensure that you get the best possible chance to win your desired auction lot. Up to bids are kept in the strictest confidence. Bidders may place up to bids on any item, meaning the designated item will be bid on that person’s behalf, automatically raising it to the next increment when needed. If the same up to bid is placed on a lot by two or more bidders, the bidder who placed the up to bid first will have priority to that bid amount and be the current high bidder. Grey Flannel Auctions will provide a Call Back Service for this auction’s Premier Lots only. In order to receive this service, you must be a registered Premier Bidder and bid on that item prior to 9:00 p.m. MST (12:00 Midnight EST) on Wednesday, December 19June 27th, 2018 and request the Call Back Service at that time. There is no Call Back Service available on non-Premier lots. We strongly recommend that those bidders (of non-Premier Lots) place "Up To" bids and check our web site for the current high bids. TO THE FULLEST EXTENT PERMISSIBLE BY APPLICABLE LAW, GFA EXPRESSLY DISCLAIMS ALL WARRANTIES OF ANY KIND, WHETHER EXPRESS OR IMPLIED, INCLUDING, BUT NOT LIMITED TO THE IMPLIED WARRANTIES OF MERCHANTABILITY, FITNESS FOR A PARTICULAR PURPOSE AND NON-INFRINGEMENT, WITH RESPECT TO PROPERTY PURCHASED THROUGH GFA. GFA MAKES NO GUARANTEES, WARRANTIES OR REPRESENTATIONS, EXPRESS OR IMPLIED, THAT THE SERVICE PROVIDED BY THE SITE WILL MEET YOUR REQUIREMENTS, OR THAT THE SERVICE WILL BE UNINTERRUPTED, TIMELY, SECURE, OR ERROR FREE; NOR DOES GFA MAKE ANY WARRANTY AS TO THE RESULTS THAT MAY BE OBTAINED FROM THE USE OF THE SITE OR AS TO THE ACCURACY OR RELIABILITY OF ANY INFORMATION OBTAINED THROUGH THE SITE OR THAT DEFECTS IN THE SOFTWARE WILL BE CORRECTED. No advice or information, whether oral or written, obtained by user from GFA through the service shall create any warranty not expressly made herein. 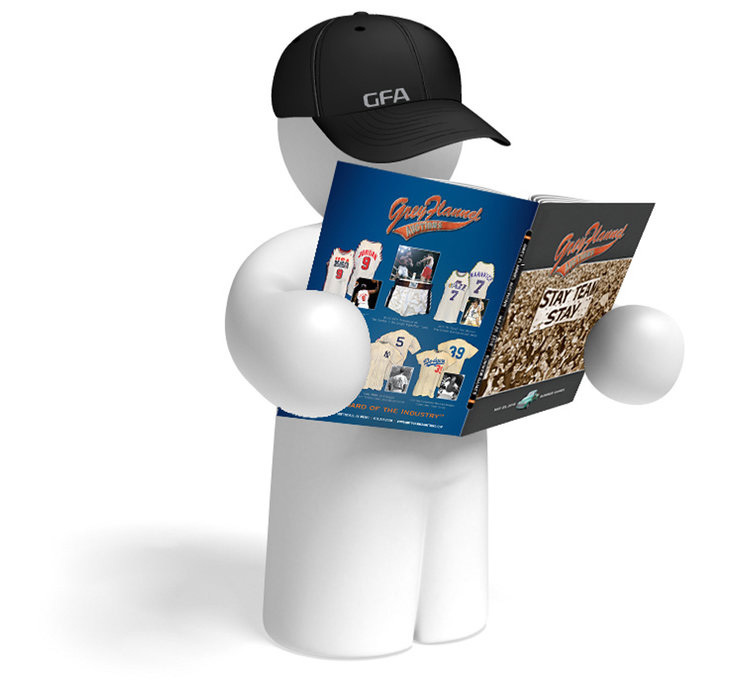 GFA LOA’S ARE ONLY ISSUED TO THE ORIGINAL PURCHASER. GFA RESERVES THE RIGHT TO ACCEPT OR REJECT ANY AND ALL BIDS OR BIDDERS. Grey Flannel Auctions is not responsible for computer or human error(s), which may result in any customer dissatisfaction. We reserve the right to accept or reject any and all bids or bidders. The term “Photo-Matched” in this sale is used when an item has been matched to a photograph of the player using that said item and/or item has been researched extensively to specific photos and it cannot be argued that it is not the specific item. It is understood that this is just the opinion of our authenticators and is not a guarantee. If GFA determines, in its sole discretion, that technical difficulties, fraud or unforeseen events compromise the integrity or viability of the auction, GFA reserves the right to void the bids at issue, and/or terminate the relevant portion of the auction, including the entire auction, and/or modify the auction. GFA does not assume responsibility for third parties' failure to act in accordance with these Terms & Conditions pertaining to the running of the auction. Stock lots are owned by GFA or one of its affiliates. All other lots are consignment items owned by others and consigned to GFA for sale pursuant to this auction. Stock lots in this auction are: 9, 38, 87, 108, 132, 159-185, 435, 504, 555, 595, 606, 798. Interest lots are those lots on which GFA has advanced monies to the lot owner prior to the auction. Interest lots in this auction are: 1, 2, 3, 4, 5, 6, 7, 8, 19, 77, 129, 149, 154, 156, 190, 196, 273, 284, 296, 311, 416, 456, 476, 499, 506, 507, 589, 687, 693, 797, 803. The buyer is responsible for all shipping, packaging, freight, crating and insurance costs. Most lots will be shipped via FedEx and USPS. This cost will be reflected on your auction invoice. If you need expedited shipping, please call when you receive your invoice before making payment so we can make the appropriate shipping adjustments. All international orders will be processed in the full invoice amount, no exceptions. The buyer is responsible for all duty and customs charges. Grey Flannel Auctions does not ship the larger auction lots from our location. The safe arrival of your item(s) is very important to us so we use a professional packing company to prepare your item to ship. Therefore, on certain lots, there will be a shipping charge that includes a packing fee as well as the FedEx charge. The packing fee is set by our outside vendor, so you pay us what we pay them. For example, if you buy a lot of large framed pieces, the packing fee will be approximately $125 plus the FedEx charges. Grey Flannel Auctions is not in business to make a profit on shipping; we would just like to recoup our costs in shipping and packaging your items as best as possible. Any item may be picked up in person at our office after funds are cleared. However, out of state residents will be required to pay New York State & Arizona sales tax. Please call ahead to make arrangements. greyflannelauctions.com (the "Site") is provided by Grey Flannel Auctions, Inc. ("GFA"). User expressly agrees that use of this Site is at User's sole risk. The Site is provided on an "AS IS" and "AS AVAILABLE" basis. To the fullest extent permissible by applicable law, GFA expressly disclaims all warranties of any kind, whether express or implied, including, but not limited to the implied warranties of merchantability, fitness for a particular purpose and non-infringement, with respect to property purchased through GFA. GFA makes no guaranteesguaranties, warranties or representations, express or implied, that the Service provided by the Site will meet your requirements, or that the Service will be uninterrupted, timely, secure, or error free; nor does GFA make any warranty as to the results that may be obtained from the use of the Site or as to the accuracy or reliability of any information obtained through the Site or that defects in the software will be corrected. No advice or information, whether oral or written, obtained by user from GFA through the service shall create any warranty not expressly made herein. GFA provides its users with an Internet Auction service (the "Service") for the purpose of buying and selling personal property. Grey Flannel Auctions’ Premier Lots for the December 19 Auction are listed below and are also identified in this sale by the “PREMIER LOT” logo. You must be registered in advance with our credit department before bidding on these items. Our credit department must be satisfied with the bidder’s ability to pay. Once approval to bid is granted, you may bid on any Premier Lot up to the amount of your approved line of credit.